The Mad Gear Zone Boss takes inspiration from the boss of Sonic the Hedgehog 2's Metropolis Zone. 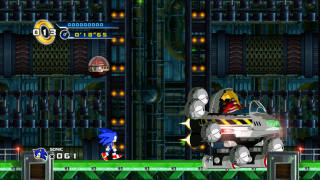 Eggman's Eggmobile has many flying balls flying around him, and hitting them causes the balls to become mini-Eggmobile balloons like the original fight. The difference here is the balloons will now explode in a set amount of time, making this boss a bit more challenging than its predecessor. After 5 hits, Eggman suddenly flees, destroys the remaining bombs, and Sonic gives chase in a running battle similar to Mushroom Hill's boss. Eggman throws more Eggmobile balloons, only now there are different types, including speedy ones and huge ones. Sonic needs to dodge them all and hit Eggman a few more times before Eggman will flee in defeat. When you hit the boss, all the bombs on screen will be destroyed to prevent you from getting hurt when going back. This page was last edited on 8 April 2018, at 08:49.